As permanent magnets, ceramic magnets have a much stronger magnetic force than most other common magnets, and their non-metallic ceramic composition makes them the most affordable magnet capable of industrial strength magnetic force. As their name implies, ceramic magnets are a sintered composite of powdered iron oxide, strontium (or barium) and ceramic powder; the finished product is a brittle and porous charcoal gray ceramic. As a result of their brittle, porous composition, ceramic magnets are often nickel coated to prevent chipping and breaking. As with powdered metal parts, ceramic magnets can be compacted into blocks, discs and arcs while in powdered form. Once the magnet is sintered, however, machining and forming can be difficult and costly; due to their brittleness and hardness, diamond cutters are usually required to machine ceramic magnets. Although the magnetic force of ceramic magnets is ranked slightly below alnico magnets (a metallic magnet composited from aluminum, nickel and cobalt) and much lower than rare earth magnets, ceramic magnets are prized not only for their cost economy but also for their magnetic permanence. 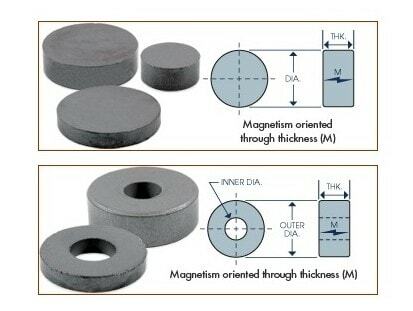 One of the most important aspects of a magnet’s ability to retain its magnetism under corrosion, vibration, exposure to electrical fields, time and heat is important because it determines for which applications a magnet may be used. Ceramic magnets have excellent magnetic permanence under corrosion and electrical exposure, making them the perfect material for DC motors, speakers and lifting, retrieving and separating corrosive materials. In addition, ceramic magnets’ magnetic permanence is beneficial in the welding and construction industries as well as other motor, sound and electromagnetic environments subject to vibration and electricity, but their thermal stability is very poor. Applications which require industrial-strength magnets to operate under high heat use either alnico magnets, which maintain magnetic permanence at up to 550 degrees Celsius, or samarium cobalt rare earth magnets, which also have excellent high heat resistance. Some examples of applications that ceramic magnets are found in many home appliances, automobiles, children’s toys, tools and equipment at the doctor’s office. In addition, ceramic magnets are often found in refrigerator magnet hooks, and they are notably stronger than other refrigerator sheet magnets’ poly-magnetic compounds. 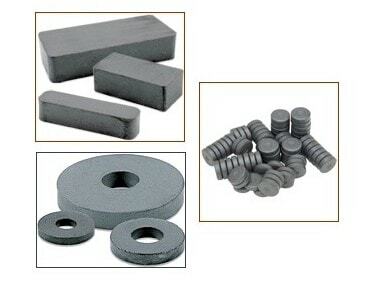 Ceramic Magnets Ceramic magnets, or ferrite magnets, are the most common magnet used in industrial applications.